This sits outside the back entrance to our church, Saint Michel, in La Ferté Saint Aubin. Dating back to August 15, 1881, local historians say it probably commemorates a mission by Ernest Froment. The La Ferté notaire also served as deputy mayor, founder of the music club "The Solonaise" and creator of the Dessales Orphanage. 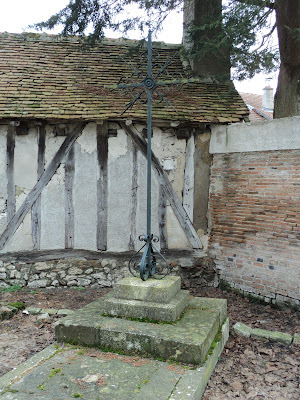 It was originally placed on the town's Route de Chaumont, but was moved near Saint Michel in 1979.